If you were a female guppy, who would you find most attractive? LOS ANGELES, California -- Guppies in the wild have evolved over at least half-a-million years � long enough for the males' coloration to have changed dramatically. 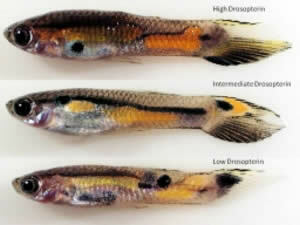 Yet a characteristic orange patch on male guppies has remained remarkably stable, though it could have become redder or more yellow. Why has it stayed the same hue of orange over such a long period of time? The females strongly preferred the intermediate males, those whose patches, or spots, were the right hue of orange � not too red and not too yellow.